The increasing scarcity of wild fish and the imminent rise in the demand for fish worldwide, now requires us to become much more self reliant. Especially in England, the miniscule aquaculture industry does not stand us in good stead for becoming more self-sufficient. There is a real need to expand the industry rapidly in order for the UK to be able to supply much of its own fresh fish in the future. Do you have an interest in rearing fish for the table? What drew you to this page in our website? Perhaps you have a pond or a lake which you would like to put to ‘good use’. Maybe you own a stretch of river or have access to the sea. You may have some out building which you would like to culture fish inside or indeed have a ready market to sell fish. What would you really like to achieve? Would you like to develop a fishery? Perhaps you have some land which could be suitable for constructing a pond to rear fish for the table following Permaculture principles. On the other hand, you may have an ambition to develop the aquaculture aspect as your business. Do you have a desire to manage your project intensively or extensively? 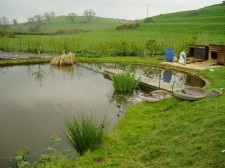 Our on line shop offers a range of useful products for your aquaculture project. We can supply fish for restocking, live fish for the table or fish for domestic use from our online shop.